The devastating recession of 2008–09 and its volatile aftermath have focused everyone’s attention on the global economy. There is growing agreement that better policies, laws and institutions are needed, but will the next economy be fair and equal for all inhabitants of Earth? No one really knows. Yet one thing is certain: the political will to create a democratically restructured economic system cannot be generated until a more realistic epistemology is embraced across the planet. When called upon to evaluate and approve new solutions for global economic and socio-ecological coordination, people will need to understand these plans in clear and simple terms. The economics of sharing has to be based, not on political interests or ideology, but on how the world and its subsystems actually work. Virtually everyone today recognizes the difference between private goods (commercial products and services created by businesses) and public goods (education, parks, roads, public safety, sanitation, utilities, legal systems and national defense provided by sovereign governments). Likewise, the contrast between private and common property has also become very sharp. In our daily lives, we readily perceive the differences between proprietary data and free information, or the berries sold at market and those found in the wild. Yet the differences between the world’s two basic forms of collective property – public goods and common goods – are often blurred. One of the great challenges before us is to create powerful and broadly recognized distinctions between public goods and commons/common goods – the shared resources which people manage by negotiating their own rules through social or customary traditions, norms and practices.1 These distinctions are pivotal. For the commons to be embraced in economic, ecological and social policy, their immediacy should be apparent to everyone. The cognitive apprehension of common goods must quicken our capacity to experience and understand the things we share beyond the enclosed spaces of private and public property. Formal categories may help clarify distinctions among private, public and common goods, but they do not convey the sense of human meaning, being and intersubjectivity that lie at the heart of any commons. Indeed, much of the literature on the commons fails to convey this sense of presence. One sometimes reads that common goods are “rivalrous” (one person’s use precludes another’s use) and “non-excludable” (it is difficult or impossible to exclude others from using the resource).2 These are ponderous claims, difficult to grasp in the moment (and also conceptually weak, as Helfrich notes in her essay in this volume). Could such non-intuitive definitions be a reason why the commons seem so abstract to many people? How can their ontological reality be recognized when common goods require so much analysis to distinguish them from public goods? This article differentiates public from commons/common goods by examining many of the theoretical and practical assumptions that lie behind public property. The sections below address various facets of this distinction and explain why a broadly shared worldview of common goods is vital to the democratic future of the planet. Indeed, acknowledging the role of common goods in our lives can provide epistemological and political leverage points for transforming the global economy and creating globally representative governance. The simplest way of contrasting a public and common good is to ask: Does this particular resource require management as a social mandate or is it an expression of social mutuality and collaboration? In other words, is this property best maintained by government or the public? This is a useful starting place, yet it raises further questions. What exactly do we mean by “public” and public goods? Postwar economists such as Paul Samuelson identified the non-rivalrous qualities of public goods and James M. Buchanan and Vincent Ostrom described their non-excludable aspects.3 These definitions seemed to corroborate John Maynard Keynes’ theory, widely adopted by Western governments during the 1930s-50s, that government intervention in the economy is a way to satisfy people’s consumption needs through more jobs and higher wages. But Keynesian policies defining “effective demand” conflate individual purchasing power (a market force that spurs wealth-creating behavior) with “personal preference satisfaction” (a broader set of human needs and wants that includes non-market satisfactions). As a result, Keynesian econo­mics virtually ignores the human desire for common goods. Government-stimulated spending and consumption identifies food, water, air, knowledge, community networks and social technologies as market goods, but not as naturally renewable or self-generated social resources. In short, state provision of public goods fails to account for the higher total net benefit that consumers would receive through self-organized and socially negotiated production, use and protection of their own resources. Hence, the commons has no definitional reality in Keynesian thought. Since the 1980s, the state has concerned itself principally with increasing the rights of private property, free markets and free trade. This has shifted the meaning of “public” even further away from common property. With the advent of neoliberalism, the public sector now refers, not to citizens self-providing their own resources for their collective benefit, but to the institutions of government provisioning that claim to improve individual well-being through private market goods which are still called public goods. In a mystifying sleight of hand, the resources we use in common are identified as public goods and then deregulated and turned over to the private sphere for production and distribution. As in the shell game of the magician, common goods disappear through the adept switching of categories: forget where you saw it before, which legal container now holds the good? In this way, goods that were once managed as commons or public goods – water, food, forests, energy, health services, schools, culture, indi­genous artifacts, parks, community zoning, knowledge, means of communication, currency, and ecological and genetic resources – have either been privatized outright or remain public or common goods in name only. To call such goods “public” (by declaring them non-rivalrous and non-excludable) is to carry the Keynesian denial of common goods a step further, embracing neoliberal doctrines that ultimately seek to make all goods private goods (and thus rivalrous and excludable). Not only does the commons vanish through this legal and linguistic shuffle, even the word “public” is stolen from the people. “Public” no longer signifies a community’s authority to manage its local resources and express its own social or ecological demands; “public” now means the central governing authority to whom we have surrendered the control of these resources, which then meets our demand through conventional private markets. Everyone sees the growing discontinuity between the masses who are excluded from governmental decision-making (through partisan majorities, rule of law, executive administration and judicial decisions) and the relative few who dominate the process to advance their own private gain. Yet there is little outcry when the word “public” is routinely applied to both the excluded masses and privileged insiders. This facile, misleading use of “public” persists chiefly because citizens have lost their direct understanding and connection with the commons. The strong epistemological frame of reference that once linked the “public sector” to our collective potential for governing and valuing our own resources and asserting a countervailing authority to private markets, has virtually disappeared. In theory, public still means people; in practice, public means government (as captured by elite interests who regularly impede the people’s political rights and capacity to control their common goods). Understanding the distinction between public and common goods also helps in resolving differences in the roles and identities of producers and consumers. This is a crucial point. In the present system, the market creates value by enclosing a common area, whether material (land, natural/mineral resources) or immaterial (culture, ideas, digital space). A division of labor between producers and consumers is created through top-down, hierarchical structures in the flow of private and public goods. This is said to increase economic efficiency, productivity and quality, while lowering the costs of goods and services. Yet many alternative communities have developed their own sets of norms and rules to oversee their collective resources sustainably. Whether these commons are traditional (rivers, forests, indigenous cultures) or emerging (solar energy, collaborative consumption, Internet), self-organizing communities take collective action to preserve their local resources, both for themselves and for future generations. It’s important to recall that the core principles of production and management in these commons are actually idealized by neoliberalism – i.e., spontaneous, self-regulating freedom (through markets) and rule-based equality (as enforced by the state). When consumers choose to become co-producers of goods and services through their own commons, however, their mutual, integrative work transcends the premises of neoliberalism. It’s evident that the freedom and equality expressed through a commons does not result from privatization, centralized institutions or the top tiers of a social hierarchy. When the users of resources are directly involved in the process of production, their local ideas, learning, imagination, deliberation and self-corrective action are embodied directly in their collaborative activities. Unlike commercial delivery chains or the bureaucratic provision of public goods and services by the state, the autonomy of individual choice is best assured through the cooperative production of value and governance by resource users themselves. The decentralized, self-governing systems of co-production also offer fairer, more direct access to resources (and thus higher efficiency) than can be gained through distributive enterprises operated as private monopolies or state hierarchies. This expands the distribution of the means of production and decision-making far more widely than through the top-down systems of the modern market/state. Hence, common goods that are managed directly and locally constitute a realm of governance and production that moves beyond the modern division of labor. Discriminating common from public goods is a vital step in the development of covenants and institutions by stakeholders who depend on specific common goods for their livelihood and welfare. When people across a community of practice or region take on the responsibility to sustain their own resources, they may formalize this through a social charter. The charter outlines a group’s rights and incentives for a shared resource. It describes patterns of relationships between the resource and its users, managers and producers. Social charters have been developed for forests, pastures, irrigation systems, aquifers, springs, lakes, fisheries, knowledge, genetic resources, public health, energy, landscapes, historic sites, cultural areas and political security regions. Social charters can also be applied to many other domains. To make them operational, resource users and producers may develop a legal entity or fiduciary association of citizen stakeholders which operates as a trust. Commons trusts are generally created to preserve depletable resources (natural, material), but many replenishable commons (social, cultural, intellectual, digital, solar) can also benefit from trusts that ensure their regeneration. Trustees set a cap on the extraction or the use of a resource according to non-monetized, inter­generational metrics such as sustainability, quality of life and well-being. For example, trusts can be developed for oil fields, aquifers and the atmosphere to ensure their long-term viability. Having protected a commons safely for future generations, the trust may rent a proportion of the resources under the cap to the private sector or to state businesses and utilities for extraction and production. A percentage of this rent could be taxed by the state and redistributed to citizens as dividends or subsistence income, with emphasis on the poor and socially marginalized. Rental or user fees may also be reinvested in the rehabilitation of depleted resources (such as land, rivers, oceans, atmosphere) and the enhancement of replenishable resources (arts, collaborative knowledge, digital codes, solar energy). 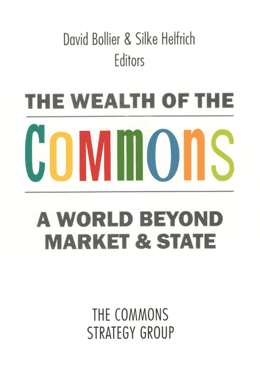 A full-spectrum, commons-based economy could thus be created through a variety of such trusts: the commons would be protected for the future, the private sector would profit from producing the resources which they rent, and the state would tax these rents to restore degraded commons, fund social dividends and encourage free culture. What segment of society could best sponsor commons/common goods apart from private and public goods? Beginning with the philosophy of Hegel, and differentiated increasingly in recent decades, civil society has identified itself as a “third sector” beyond the market and state. By defining the interests and advocating for the rights of the unrepresented, global networks, nongovernmental organ­izations, citizens associations and social movements have become a genuine voice of global public opinion. Indeed, many of the interests they are pursuing – healthy food, clean water, clean air, environmental protection, green energy, free flow of information, social technologies, human rights and indigenous peoples’ rights – are common pool resources that could be managed as commons. Yet these self-selected groups do not carry the authority of global representative democracy, since public opinion lacks the legitimacy of people’s votes through an electoral process and thus does not increase their political equality in society. Without a credible political mandate, civil society typically challenges specific applications of global authority but rarely its underlying structure. In affirming and upholding the constitutional premises of neoliberalism (including the primacy of individual rights, private property and sovereign borders), most civil society organizations support the embedded division of labor between producers and consumers and thus the enclosure of the commons. This leaves civil society co-dependent on business and government and vulnerable to exploitation. Unable to stand as a true opposition party, civil society faces a huge obstacle in establishing itself as a transformational alternative. Here is where civil society can learn from commons groups the importance of involving resource users in the process of production. As noted earlier, the commons involve producers who consume their own goods. When resource users are also co-producers, their motivations, knowledge and skills become part of the production praxis, leading to new ways of interacting and coordinating social and economic life. A new production and governance logic of learning-by-doing then becomes possible. Civil society could apply this principle in its own work by embracing these innovative means of co-production and co-governance.4 For example, emerging forms of peer-to-peer creativity and management – such as free software, open hardware groups and the horizontalist decision-making demonstrated by Occupy Wall Street – can teach civil society organizations how to adopt open source (rather than market-driven) values and structures. By operating both as resource users and as producers, enabling local stakeholders to develop their own political power, civil society groups could expand the scope of collective rights, moral legitimacy and civic power that exists beyond the state. Through discovering their necessary role in the global commons movement, the world’s civil society organizations would develop a more dynamic basis for collective action, social solidarity and direct democracy than currently exists. As catalysts for the integration of producers and consumers, many civil society organizations could evolve into local/regional councils and commons trusts, or perhaps form partnerships with them. The increased participation and political choices offered to citizens through these new accountability structures would transform economic, social and political decision-making at all levels of commons (local, state, interstate, regional, and global). This would resolve the present contradiction between the internationalist ideals of civil society groups for redistributing social and natural resources, and their financial and political fears of challenging corporate and state restrictions on the equitable access, protection and use of these commons/common goods. By fostering the collective production and governance of common goods through new forms of participation and trusteeship (instead of private/public ownership), the various movements of civil society, which are after all unelected and self-appointed, would become far more accountable to the people they claim to represent. Discriminating common goods from public goods is crucial in recognizing our essential rights to the commons as global citizens. Presently, people’s rights to global citizenship are not acknowledged or affirmed because citizen representation is vested in the state and does not go beyond the state level. As national citizens, we empower governments through an implicit social contract, bestowing legitimacy and authority upon the state in return for the public goods of protection, security, infrastructure and other services. In surrendering our deeply personal, subjective power of decision-making to government (which redeploys this power by granting corporations the right to produce and dispense private goods), the idea of an active citizenship with identity and purpose is gravely weakened. Yet it’s human beings as a collective who are sovereign – not their governments. The inalienable rights of people originate, not in authority over a territorial area, but through a customary or emerging identification with an ecology; a form of collective labor; a social technology; a community need or shared conviction; a cultural resource area; an ethnic, religious and linguistic affinity; or a historical identity. When groups of people recognize that the capacity of their commons to support life and development is in decline, this may spur them to claim long-term authority over resources, governance and social value as their planetary birthrights, both at a community and global level. These natural rights to every resource – the atmosphere, oceans, forests and species, food, water, energy and health care, technology, media, trade and finance – arise from a community’s dependence on particular commons for survival and security, and from a duty to safeguard the welfare of future generations. The human need for sustenance and livelihood vests these local groups with a new moral and social responsibility: to engage resource users directly in the preservation, access and production of their own commons. Rather than seek individual or civil rights from the state, commoners declare their sovereign rights as global citizens to protect, access, produce, manage and use this shared resource. People’s sovereignty for a commons is legitimated through global citizenship, and this global citizenship is legitimated through the local sovereignty of their commons. This is not circular reasoning; it’s the expression of multi-scale decision-making and a planetary identity that transcends the authority of state institutions and recognizes the legitimacy of people’s claims as trustees of the world’s resources at every level of common property. Over the past few decades, the intergovernmental system has proclaimed its capacity to meet the needs of the world’s population and environment through global public goods. This concept – a hybrid of Keynesian internationalism and corporate/financial neoliberalism – illustrates the lack of understanding and vision in the present management of the global commons. By the Samuelson/Buchanan/Ostrom definition, non-rivalrous and non-excludable public goods are said to be provided by sovereign governments to the citizens within their jurisdictional borders. But this model is virtually meaningless at the multilateral level where there is no representative authority (either through individual states in association or a global institutional framework) to provide public goods to the citizens of the world. When a state competes across borders for economic resources (commodities, investment, credit) or political resources (strategic surpluses, military advantage, diplomatic sanctions), these goods are certainly rivalrous. Likewise, when a state fails to provide food, developmental assistance or technological transfers to alleviate poverty for its own citizens or those in other nations, millions of people are clearly excluded from access to these goods. In reality, the propaganda bubble behind “global public goods” is fueled by the market forces of rivalry and excludability inherent in private goods, which are profit-driven for the benefit of shareholders, rather than equity-driven for the masses. National governments simply do not have the interdependent power or legitimacy – nor are they designed – to protect, manage and distribute resources for the world’s people as a whole. Yet the liberal myth of global public goods has tentacles everywhere. Under the present system of strong state sovereignty, noninterference across borders and limited multilateral cooperation, governments refuse to establish a representative basis for global resource sovereignty. Both the private and public sectors deny that the world’s collective action problems – access to food and water, universal health care, education, distribution of aid and technology, transborder safety and security, world peace, a just legal and political system, a pollution-free environment, clean air and an equitable economic system – can or should be managed as global commons. Meanwhile, the neoliberal commitment by states to private/public growth is destroying the planet and leaving people dispossessed of these collective resources, unable to express or realize the intrinsic value of their local, regional and global commons. It’s time for a rational conversation on the norms, rights and duties of every citizen for global common goods: the shared resources that must be negotiated and organized by the world’s people themselves. For legitimate forms of commons democracy to be rooted in and distributed across all political communities, a major reconfiguration of socio-economic relations, rules and institutions is needed. To this end, common goods offer the possibility of a legal and constitutional basis for democratic global governance. In bringing this platform forward, the world’s people must organize their local commons, declare their sovereignty as global citizens, and call upon governments to acknowledge the natural rights belonging to all human beings and life-forms across the planet. The people’s contract for global citizenship will empower resource communities and civil society organizations to create trusteeships, which include but transcend parliamentary forms of governance, giving them a democratic means for voicing local claims to self-determination outside the state system. By this means, national sovereign authority may be renegotiated in terms of commons resource areas and bioregions. Resource users and producers/providers would then make direct decisions on all common properties of significance, holding and managing them for future and existing generations and species. Since every resource domain is unique and so many commons overlap, commons management would be deliberated through local, state, interstate, regional, and global stakeholder discussions. In this way, democratic commons institutions would operate at every level of governance independently while overlapping at the same time. Obviously, the development of global governance is an enormous challenge. The basis of the sovereign state must be entirely reformulated. By agreeing to a new foundation for common goods in social and economic laws and institutions, the state will have to reduce the dominant role of private goods and recognize the moral and political legitimacy of people’s rights to preserve, access, produce, manage and use their own resources. This means developing a new epistemology of resource sovereignty, shared responsibility and legal accountability that recognizes the rights of world citizens to their commons. When the self-organized and participatory systems of common property, social charters and commons trusts are infused into global constitutional governance, the checks and balances that already exist within many nations will find a more perfect expression in the representative decision-making and political equality of democratic commons institutions. The new global economic system and its social contract will be grounded, not in corporate claims or state sovereignty, but in the sovereign rights of citizens to their common goods. 1. Although it’s not the focus of this article, the differentiation of common goods from common-pool resources (CPRs) is also important. CPRs generally involve an open access regime where there is no system for managing resources; they are freely available for anyone to appropriate because no rights or rules exist for governing them. In a commons, on the other hand, people negotiate their own agreements – both functional and cultural – to manage their shared resources. Common goods thus tend to be managed by informal rules and norms that do not exist in open access regimes like CPRs. 2. For more on the concepts of rivalry and excludability, see Silke Helfrich’s essay. 4. While some grassroots activists in international development already follow this principle, the practice of commoning through the mass distribution of production and governance has not yet broken through to the rest of civil society. James Quilligan (USA) has been an activist in the Common Heritage and international development fields since the 1970s. He specializes in the epistemology and ontology of the commons and their connection with political and monetary structure.